This week’s unitasker will (not) amaze you! This week’s unitasker will (not) blow your mind! This week’s unitasker is the $200 True Mirror. Over the past couple weeks you may have noticed some exciting changes to the Unclutterer site. Our tech team has been working diligently to bring you a new and improved experience, and we’re all very happy with the transformations. The biggest change is how the site looks on mobile devices now. Or, rather, I should say the site now looks awesome on mobile devices. If you have a smartphone or tablet, be sure to check out our fancy new appearance. BlackBerry users are going to notice the greatest improvement — no more scrolling through categories to get to the content! Everyone else is going to love the single column of content instead of all three columns appearing. I love, Love, LOVE these changes. The desktop version of our website also got a minor facelift. The search function is significantly easier to find and sharing articles is much more convenient. We’ve also increased the width of the content column so we can provide larger images. On the technical side, we’ve upgraded the server. Most everyone should notice a slight improvement in access speed as a result. If you discover any bugs, please contact us so we can try our best to fix it. We want everyone who comes to our site to have a wonderful experience. If you like the changes, please feel welcome to share your thoughts in the comments — our tech team did a fantastic job and we would love for them to hear it from you, too. Thank you, PJ and Dancing Mammoth, for the work you’ve done to make us better. I always find the days before a trip to be hectic, but with a checklist I can take a quick glance at it and make sure I didn’t forget anything I meant to do. It’s great to have a checklist detailing what you want to pack, but a checklist of things to do in the days before a trip is helpful to keep you organized. The following are some items from my pre-travel checklist. It is based on being a single person with pets but no children, and a neighbor who will bring in the mail when she comes over to feed the cats. I’ve excluded any trip planning — making hotel reservations, deciding what I want to do while there, etc. — because those actions were completed during the travel-planning stage. Update cat/home care instructions as necessary. Make sure there’s enough cat food and kitty litter. Decide if there are any bills to be paid before leaving (and then pay them). Alternatively, schedule payments electronically to go out at appropriate dates during my trip. Check thermostat levels and adjust as needed. Clean out perishables from refrigerator; use them up or give them away. Makes sure I know the luggage rules for my airline. Get prescription refills as needed. Make sure all the over-the-counter medicines I want to take have not expired; replace if need be. Buy any gifts I want for people I’m visiting. Check the weather forecast for my destination. Charge up any electronics I’m taking with me. Load any documents I might want to Dropbox. Get all contact information for my destination into my cell phone. Download any apps I want that are specific to the place I’m visiting. Arrange transportation to the airport, if needed. Get maintenance done on the car, if needed. Get a haircut, if needed. Remove unnecessary things from my wallet. Remove unnecessary keys from my key ring. Mail off my absentee ballot, if traveling at election time. Make sure relevant people have my travel itinerary and know how to reach me. If I’m traveling internationally, make sure those people also have a copy of my passport. Make sure I have a hard drive with a recent full backup in my safe deposit box. Make sure any roles I serve in organizations will be covered while I’m gone. Make sure I’m OK on passport and visas, if needed. Understand immunization requirements, and get any that I need. Learn a few key phrases in the language of the place I’m visiting, if it’s not English. Call credit card companies and tell them charges will be coming in. Decide if I need to use my cell phone — and if so, figure out how to do that most economically. Why create such a checklist, especially when it’s all pretty much common sense? Because I’ve had a few close calls when I’ve forgotten to do things that would have seriously disrupted my plans. One time, I didn’t realize my passport was about to expire, right before an international trip. Fortunately, the friend I was traveling with noticed it in time for me to get a renewal. And, I once got a last-minute immunization at the San Francisco International Airport, right before boarding a flight. There have been less serious incidents, too. Many years ago, I found myself in New Orleans during an unusual cold snap, without warm-enough clothes. I’ve also found myself running around at the last minute getting a new bottle of Advil and a tube of Neosporin. I got tired of having this type of thing happen, so now I have a checklist. What is on your pre-travel checklist? Share your must-do items in the comments. Each business and organization has its own culture — a mix of personalities and traditions and guidelines, which give the work environment a distinct feel. Since not all of the Unclutterer team works out of our main office, our culture is more collegial than authoritarian and we mostly communicate online. And, when I used the word collegial just then, I meant we spend a lot of time talking about kids and board games and furry friends and laundry and cool stuff we find online. It’s a special brush to specifically fit inside a 5″-diameter flower pot. And, the fact that it fits inside just one size flower pot is a red flag, but in theory you could use it on larger flower pots instead of buying other brushes for your larger pots. So, it’s not the size that makes it a unitasker, though certainly something to consider. Next, it was decided a brush to only clean flower pots isn’t what pushes it into the unitasker category, either. Although, you could easily use any other general purpose bristle brush for the same task and other tasks. You could also use a rag. General purpose bristle brushes and rags are multi-tasking wonders in comparison to a brush made just for cleaning flower pots. Oh how I love the conversations I get to have with the Unclutterer team. I’m so thankful this is as tough as it gets. Spring has (almost) sprung in the northern hemisphere. Are your outdoor spaces ready for the warming temperatures? Dave has fallen in love with the Arc Notebook and he explains why. Photographing the kids’ artwork is a great way to keep from having to save everything junior creates in a physical form. Photographs save the memories without sacrificing storage space. Digital images are easy to organize, but getting decent shots of the kids’ work can be difficult. 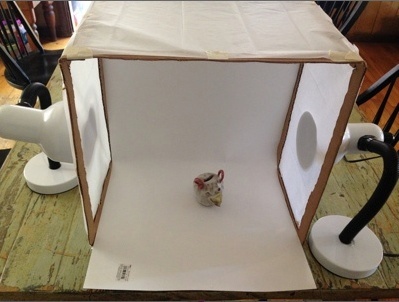 Creating a DIY lightbox can be a cheap, inexpensive solution for getting great, memorable shots. A couple of years ago, I suggested a few strategies for organizing your kids’ artwork. Once you’ve picked out your favorites, it’s nice to frame them for a home gallery or to create an album, like those from Shutterfly or Apple. But like I mentioned earlier, taking a good photo of Jr.’s art project isn’t always easy. Lighting and a “noisy” background can be troublesome. Fortunately, the solution is simple, effective, and inexpensive. The following instructions are how I made a simple light box out of materials I (mostly) already had at home. To get started, cut the flaps off of the box’s top and then place it on its side. Next, use a ruler to mark one inch from the edge on the side of the box. Then use a strait edge to mark off lines one inch away from the edge. Use the box cutter to cut out that inner square section of cardboard. (You’re making the sides look like three cardboard picture frames attached to the bottom and one side of the box. See the image above.) Repeat that process on two other sides, leaving the bottom intact. Next, add your light-diffusing material: tissue paper. Cut a sheet of plain white tissue paper so that it’ll cover the three sides of the box that you cut. Tape it into place. Now for the poster board. This part is a little bit tricky. Cut a piece of poster board that’s as wide as the opening to your box but twice as long. Slide it into the box and up the back so that it’s touching the top. Make sure not to crease the poster board. If you do, that crease will really show up in your photos. The idea is to make an “infinite” background of white. That’s it! The box has been constructed. Now you need two light sources. 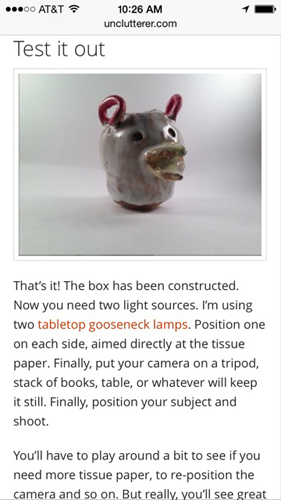 I’m using two tabletop gooseneck lamps. Position one on each side, aimed directly at the tissue paper. Finally, put your camera on a tripod, stack of books, table, or whatever will keep it still. Finally, position your subject and shoot. You’ll have to play around a bit to see if you need more tissue paper, to re-position the camera and so on. But really, you’ll see great results right away. When you’re done, upload the photos to your favorite service, do what you want with the digital image, and enjoy your great-looking archive of the kids’ beautiful art. 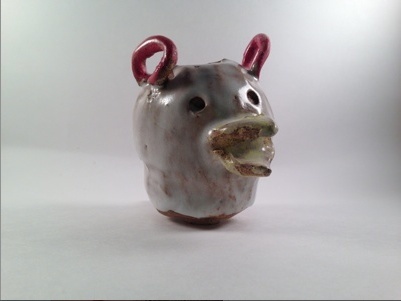 Additional tips: Above, I photographed a little clay sculpture. If you’re doing something flat like a painting, carefully remove the top piece of tissue paper and shoot down. Also, you can add more light buy putting another source pointing into the box from the top. This whole project cost me less than twenty dollars (I bought two lamps) and I’m thrilled with the results. Also, if you’re not the DIY type, you can buy a premade lightbox for around $40. Today’s unitasker is quite possibly one of the worst product ideas I can possibly imagine — a holder that puts a $400 (or more) digital product near the stream of pee of a toddler just learning to use the potty. Earlier this week, I set up a new computer and it wasn’t completely horrible, thanks to “cloud storage.” Nearly all of my important information — contacts, photos, music, and more — isn’t stored on my computer. Therefore, once I got the new laptop connected to the Internet, all I had to do was log into the various services I subscribe to and I was back in business. Years ago, buying a new computer was a bittersweet process. It’s always exciting to get a shiny, new machine, but the process of transferring your data from the old one to the new one was painful. I can remember emailing stuff to myself, using a USB flash drive over and over and even connecting two computers with a cable. Not to mention the hours and hours of time spent waiting for huge collections of photos and music to transfer, and the stress of getting emails and contacts in place. A terabyte of storage for free. If you’re shooting 7 megapixel photos, that’s 499,000 individual, full-resolution shots. Privacy. It’s easy to determine who gets access to which photo. Browse and share photos in full resolution. Mobile apps. There’s a Flickr app for the iPhone and Google Play. I haven’t used the Google Play app, but the iPhone version features auto-upload, meaning every photo you shoot is sent to Flickr automatically (and set to private by default). It’s instant, hands-off backup. Who you stay in touch with is another extremely important set of data. I use Apple’s iCloud for storing all of my contact information. Whenever I add, update, or organize information for a person or business, it’s backed up to Apple’s servers. (And shares that information with all of my Apple iCloud-connected devices.) When I get a new computer, I simply log in and it’s downloaded instantly. If you don’t use Mac products, you can have similar functionality with Google’s Gmail, Yahoo mail, and others. Again, this is mission-critical data that can’t be lost. I can’t imagine the horror of having my calendar information deleted. Fortunately, I needn’t perform any data transfer dark magic because everything lives on Google Calendar. Google Calendar, or Gcal as I call it, works with my Mac and iPhone seamlessly. It’s super easy to share information with others and integrates with other apps that I love. Gcal works on all major operating systems. There are several ways to keep almost every other kind of document off your computer and in the cloud. Dropbox is an obvious choice (this is what Erin uses). The company offers 2 GB of online storage for free, and more if you’re interested in paying for it. It works with Macs, Windows machines, iOS, Android and nearly any modern web browser. Box.net is another popular choice, with much the same functionality. I rely heavily on iCloud again here. Most of my writing is done in a Mac app called Byword, which will automatically upload any document I write to iCloud. When I set up my new computer, all I had to do was install Byword, launch it, sign in, and all of my documents were ready to go. 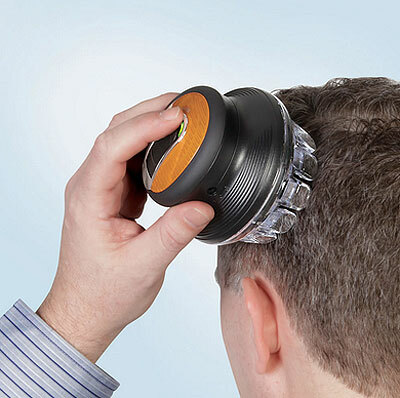 It’s a hair trimmer for the small portion of the population who wears a buzz cut, hates going to the barber for a $7 trim, only wants to use products that reference just one hand, and doesn’t already own a much more versatile Wahl Trimmer. 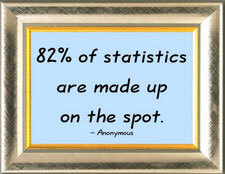 Which, and I’m sure this can be backed up by science or math or that thing called statistics, is exactly four people. A regular trimmer can be used for all different lengths of hair, your beard, your mustache, and on your dog. A regular trimmer also allows you to create multiple styles by having shorter hair on the back and sides of your head and longer hair on top. I’m going to guess that a regular trimmer will also last longer and have a better product warranty. Plus, you can use a regular trimmer with two hands if you want to and you won’t feel like you’re betraying an odd product name. I’m so sad there isn’t an infomercial for The Single Handed Barber. I’d love to see the distress clips of men flubbing up their hair. More Fun! Architect and industrial designer Katerina Kamprani of KK Studio in Greece has an incredibly fun gallery of totally useless items she has created called The Uncomfortable. Kamprani says she “decided to create and design for all the wrong reasons. Vindictive and nasty? Or a helpful study of everyday objects? 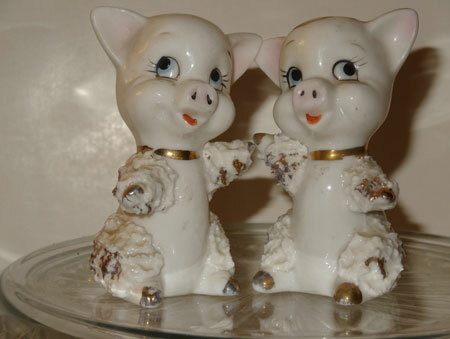 The goal is to re-design useful objects making them uncomfortable but usable and maintain the semiotics of the original item.” Whatever the reason, the objects are quite entertaining. She even has a Facebook page you can like to keep up with her latest Uncomfortable additions.